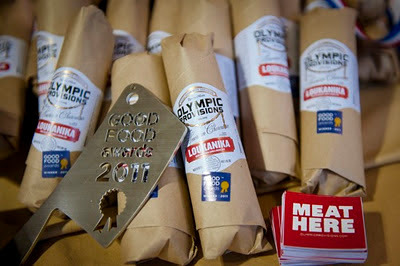 Now in it's second year, the Good Food Awards comes to the San Francisco Ferry Building this weekend. It's a celebration of food in the categories of beer, charcuterie, cheese, chocolate, coffee, pickles, preserves and spirits. The awards draw attention to the most delicious, authentic (no artificial ingredients) and responsible food (GMO-free, respect and fair compensation). More details on the guiding principles here. The awards are a great way to learn about some of the best speciality foods being produced in America today and if you come to the award ceremony or the marketplace, a chance to meet the makers firsthand. 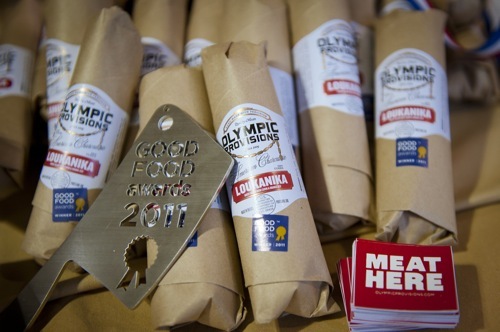 After the winners are announced, the winning products and the rest of the finalists and even last year's winners, will be available nationwide in a dedicated Good Food Awards e-store on Gilt Taste. Other sponsors include Whole Foods Market, Williams-Sonoma and Bi-Rite Market so expect some of the winners to be carried at those stores as well. Last year's winners included some of my favorite things, including prosciutto from La Quercia, Red Hawk cheese from Cowgirl Creamery. the Salty Sweet Cashew bar from Charles Chocolates and the Ellelle Kitchen's Central Coast Raspberry jam. If you are not in the industry and attending the Fancy Food Show next week (or even if you are), this is a great way to discover new and tasty things. Taste, buy and celebrate the award winning products from craft producers in 26 states who are redefining ‘good food’ by creating products that are not only tasty, but also authentic and responsibly produced. Meet the 99 Good Food Award Winners, mingle with Ruth Reichl, Alice Waters, William Werner and many more at the gala reception. Enjoy small plates featuring the winning products (as envisioned by Foreign Cinema, Boxing Room, Bar Agricole and more) and an open bar with famed mixologists, the Bon Vivants.